This post was authored by Rohan Kumar, General Manager Database Systems Engineering. Today at PASS Summit 2017, we are showcasing new advances across SQL Server 2017 and our Azure data services. And we’re demonstrating how these products – both on-premises and in the cloud – come together to form the ultimate hybrid data platform. Our recent announcements, here at PASS Summit and at Ignite in September are great examples of how we’re empowering data professionals – like our community here at PASS Summit 2017 – to do more and achieve more. With the recent launch of SQL Server 2017, the first database with AI built-in, you can now run your production workloads on Linux, Windows, and Docker. SQL Server 2017 delivers a mission-critical database with everything built-in, on the platform of your choice. And, it can unlock seamless DevOps with Docker Enterprise Edition containers, bringing efficiency and simplicity to your innovation. New features enable analysis of graph data, and advanced analytics using Python and R. We have incorporated your feedback to add features that will make your day-to-day job easier like Adaptive Query Processing and Automatic Plan Correction by finding and fixing performance regressions automatically. In addition, SQL Server 2017 running on Windows and Linux can take advantage of new leaps forward in hardware. 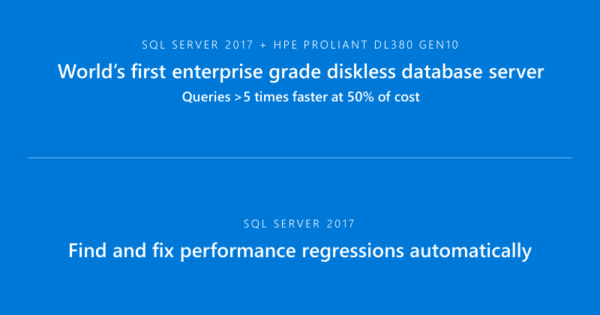 As demonstrated today by Bob Ward, SQL Server 2017 on SUSE Enterprise Linux Server on an HPE ProLiant DL380 Gen 10 Server with scalable persistent memory ran queries more than 5 times faster than a fast SSD drive array at 50% of the cost – making it the world’s first enterprise-grade diskless database server. These new cross-platform capabilities have made SQL Server accessible to users of Windows, Linux and Mac. At PASS Summit, we are excited to provide a sneak peek at Microsoft SQL Operations Studio. In a few weeks, users will be able to download and evaluate this free, light-weight tool for modern database development and operations on Windows, Mac or Linux machines for SQL Server, Azure SQL Database, and Azure SQL Data Warehouse. Increase your productivity with smart T-SQL code snippets and customizable dashboards to monitor and quickly detect performance bottlenecks in your SQL databases on-premises or in Azure. You’ll be able to leverage your favorite command line tools like Bash, PowerShell, sqlcmd, bcp and ssh in the Integrated Terminal window. Users can contribute directly to SQL Operations Studio via pull requests from the GitHub repository. For customers who are ready to modernize to the cloud, Azure SQL Database Managed Instance and Azure Database Migration Service, both now in private preview, making it easy to lift-and-shift your on-premises SQL Server workloads with few or no changes. The upcoming Azure Hybrid Benefit for SQL Server enables customers to use on-premises SQL Server licenses for the easiest lift and shift of SQL Server workloads to the fully-managed cloud. Azure SQL Database is ready for your most mission-critical workloads. Today, we demonstrated the high scale and performance of SQL Database, with the ability to insert 1.4 million rows per second. In addition, we are making it easier than ever to gain insights from data at this scale. 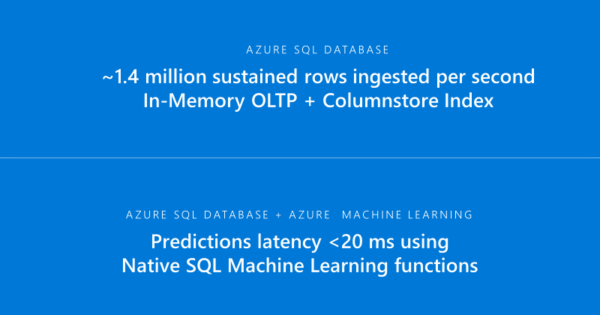 We recently made generally available, the ability to run advanced analytics models from Azure Machine Learning super-fast from T-SQL, with new Native T-SQL scoring. And in today’s demos, we show how you can use this new capability to score large amounts of data in real time – at an average of under 20ms per row! Starting in early 2016, we have been delivering machine-learning based customer value directly into the Azure SQL Database managed service. More recently, we’ve delivered several intelligent capabilities including automatic tuning, performance monitoring and tuning, Adaptive Query Processing, and Threat Detection. These capabilities significantly reduce time requires to manage anywhere from one to thousands of databases and help proactively defend against potential threats. And the preview Vulnerability Assessment feature helps you more easily understand your security and compliance with new initiatives like GDPR. In addition to sharing the same “everything built-in” SKU model with SQL Server for lower total cost of ownership versus competitors, Azure SQL Database adds value to your database with these built-in administration features. Now it’s easier than ever to move to Azure SQL Database with our new partnership with Attunity. Customers can now take advantage of Attunity Replicate for Microsoft Migrations, a free offer that accelerates migrations from various database systems, including Oracle, Amazon Redshift, and PostgreSQL to the Microsoft Data Platform. To simplify analytics in the cloud, we’re releasing a public preview of new hybrid data integration capabilities in Azure Data Factory including the ability to run SSIS packages within the service. This means you can run your SSIS data integration workloads in Azure, without changing the packages – for true hybrid data integration across on-premises and cloud. And our SSIS partner technologies like Biml can now work to automate and enhance data integration across on-premises and cloud. 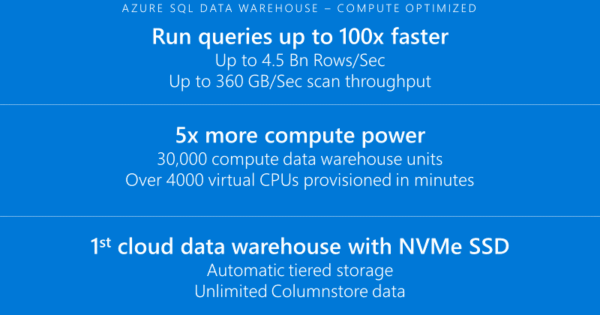 Dramatic scale investments are now in public preview for Azure SQL Data Warehouse. With the new Compute-Optimized Tier, you can get up to 100x the performance and 5x the scale. This new tier builds on the existing optimized for elasticity tier – giving customers the benefit of a fully-managed platform that suits the demands of their workload. Visualizing data helps users across the organization take informed action. Microsoft delivers Business Intelligence capabilities to help customers model, analyze, and deliver business insights, which can be consumed by business users on mobile devices, on the web or embedded in applications. Analysis Services helps you transform complex data into semantic models making it easy for business users to understand and analyze large amounts of data across different data sources. The same enterprise-grade SQL Server Analysis Services you’ve used on-premises is also available as a fully managed service in Azure. With today’s announcement of the Scale Out feature for Azure Analysis Services, you can easily set the number of replicas for your Azure Analysis Services instances to support large numbers of concurrent users with blazing fast query performance. Power BI is a market leading SaaS service that is easy to get started and simple to use, with data connections to many on-premises and cloud data sources. It allows users across roles and industries to go from data to insights in minutes. A recent key addition to the Power BI portfolio is Power BI Report Server. Power BI Report Server enables self-service BI and enterprise reporting, all in one on-premises solution by allowing you to manage your SQL Server Reporting Services (SSRS) reports alongside your Power BI reports. Today we announce the availability of a new version of Power BI Report Server that will enable keeping Power BI reports on-premises that connect to any data! Read more on the Power BI blog. Microsoft’s guiding principle has been to build the highest performing, most secure, and consistent data platform for all your applications across on-premises and cloud. By joining us on this journey, you can build upon your investments in SQL Server to expand the scope of your role in your organization, from database systems to advanced analytics and artificial intelligence. We look forward to working with you! If you aren’t with us at PASS Summit 2017 this week, you can still see the announcements and demonstrations by purchasing session recordings to stream or download and watch at home. Sign up at the PASS Summit Website. If you’d like to learn more about the latest enhancements in the Microsoft Data Platform, visit our data platform webpage, or data platform overview on Azure.